Online shopping has taken over the retail stores by becoming the most convenient way for users to pick their own styles. Have you ever wondered what is the best part of shopping online? Customers are happy to shop from anywhere at anytime but their real happiness is seen when they receive their product at the doorstep. This process of shipping products safely to the customers in time looks extremely appealing but the real story is a lot different. Providing timely delivery of products to each and every customer at distinct locations would have been next to impossible without the help of the ecommerce courier companies. Are you an online retailer trying to please the customers with your attractive products? If yes, then you must have realized that customers are not only looking for amazing products but also for a speedy delivery. Imagine if your customers have loved the products of your online store but received a very late delivery when they order from your store. This will ultimately have adverse effects like losing customers and affect the profit margins of the company. Choosing the best logistics company for ecommerce business is a critical step and needs careful analysis. If your long-term goal is to serve customers at distinct locations across the world then making an incorrect choice regarding the logistics partners can be extremely harmful. Here is a set of few vital questions which must be answered before you pick up a shipping partner for your business. 1. Is your choice cost-effective? Integration with the ecommerce courier companies can ensure hassle free and timely delivery of your products. The weight of the product)and delivery pin codes are the deciding factors for calculating the rates of the logistics provider. 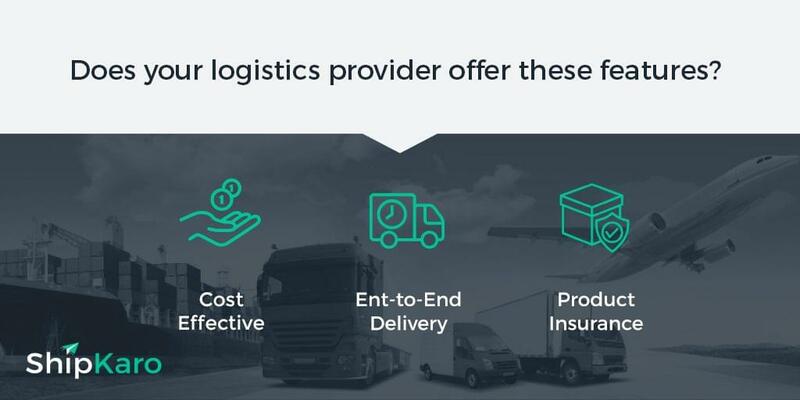 On one hand, even if a single logistics provider has a wide coverage relying on only one partner for your deliveries is not a very wise choice. On the other hand, Paying upfront security amount to multiple partners can burn holes in your pocket. You should look for a tie-up or shipping platform that allows you to choose multiple shipping partners without shelling out lots of money. Moreover, covering all the projected areas depending on your products is one more point to be considered. Not all the logistics providers offer services for remote areas and offer delivery to tier 2 and tier 3 places. 2. End-To-End delivery, covered or not? The definition of a reliable shipping partner is effective and timely delivery to the customers residing in every corner of the country and the world. The courier companies which provide end-to-end delivery service should be preferred over local delivery partners. The end to end delivery process starts from dispatching the orders and a number of vital steps are included in transit like tracking services, printing of invoices and shipping labels etc. The successful last mile in transit right from the initial phase can make your view crystal clear whether the particular ecommerce delivery solution can fulfill your needs or not. 3. Do they offer insurance? Bearing the costs of lost or misplaced orders is the biggest pain of ecommerce. Partnering with an ecommerce courier company which does not provide insurance for the products can cost you more if the package is lost. Due to manual errors like incorrect labeling or missing pin codes, about 10% of the products are misplaced in transit. Hence you should carefully read and consider the insurance policy of the ecommerce courier companies before finalizing them as partners. With all the listed tips, your ecommerce business can truly be a success and help in getting a better ROI along with customer satisfaction. Are you still having a tough time finding a perfect logistic partner for your business? If you are have been unable to find a comprehensive shipping solution that fulfills all your business needs you should consider ShipKaro. ShipKaro offers shipping aggregator service with multiple logistics partners. We provide numerous features like discounted shipping, automatic order syncing, price comparison and a lot more for the customers at affordable prices which make the entire shipping process easy and a fun process. Sign up for free and get started now to know more about us.